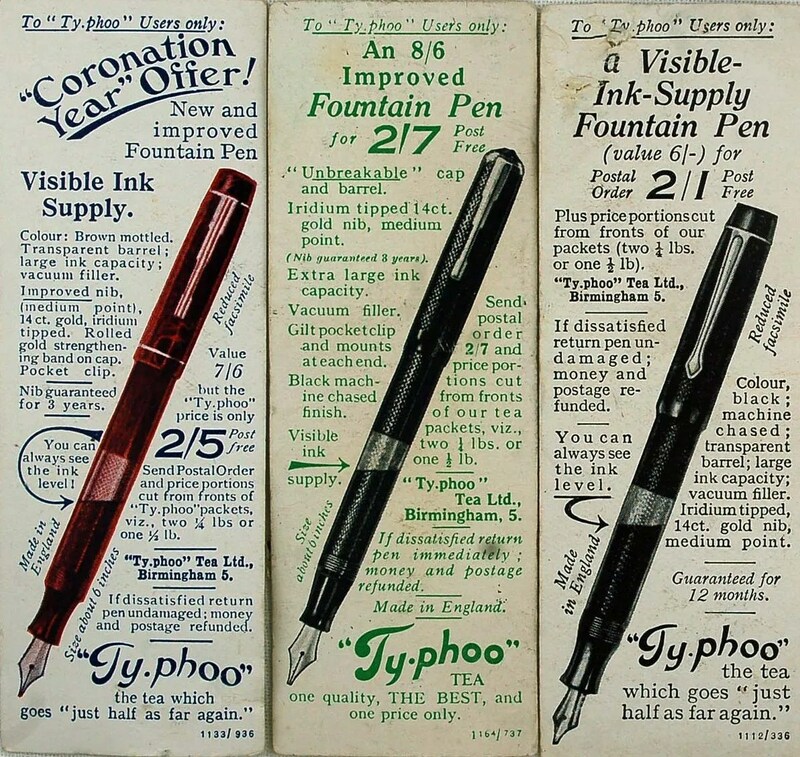 Back on January 19, 2008, I wrote in a post titled Tea Anyone?, about the restoration of Typhoo Tea Fountain Pen (photo below). In that post, I also shared two photos of cards that came with the English Tea. One was Trees of the Countryside and one was Interesting Events in British History. Recently, I was fortunate to find a few more. 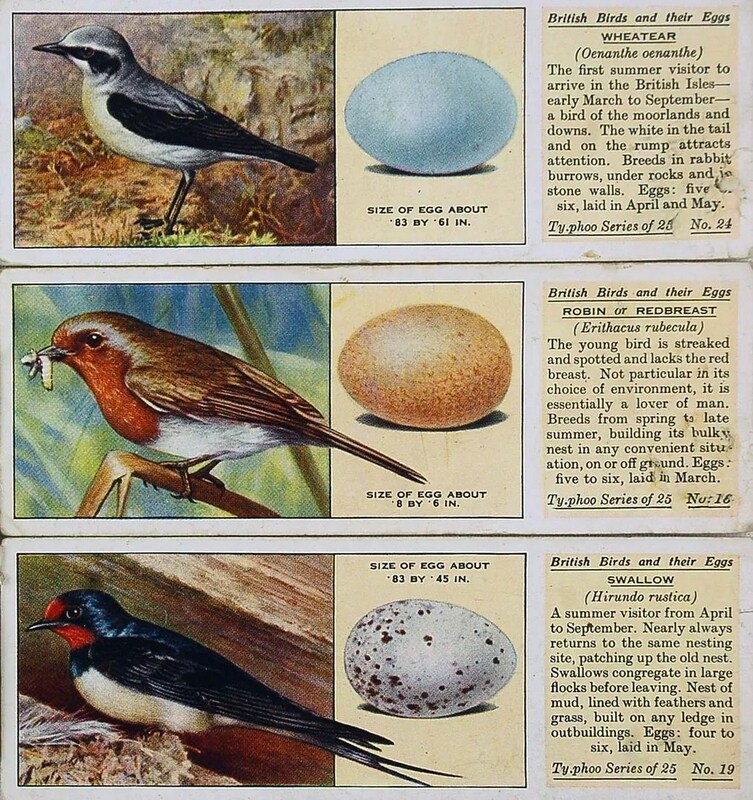 The sets that I acquired are from the Wild Flowers In Their Families and British Birds And Their Eggs sets. I have photographed a few below. Interestingly, the Coronation Year Offer for the Vacuum Filler is from the 1937 Coronation of George VI. Coronation History can be viewed here. 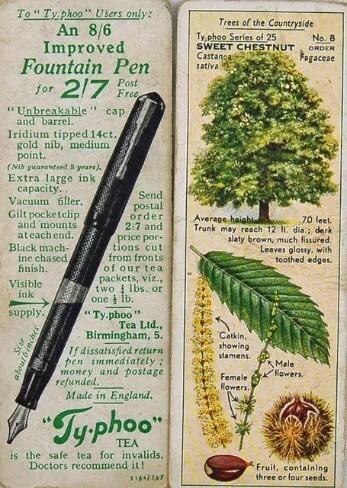 I do not have any Typhoo pens from this vintage, and my pen is from an earlier vintage. However, I find these cards an interesting part of Fountain Pen History. To read more about the sets produced, read this web article. 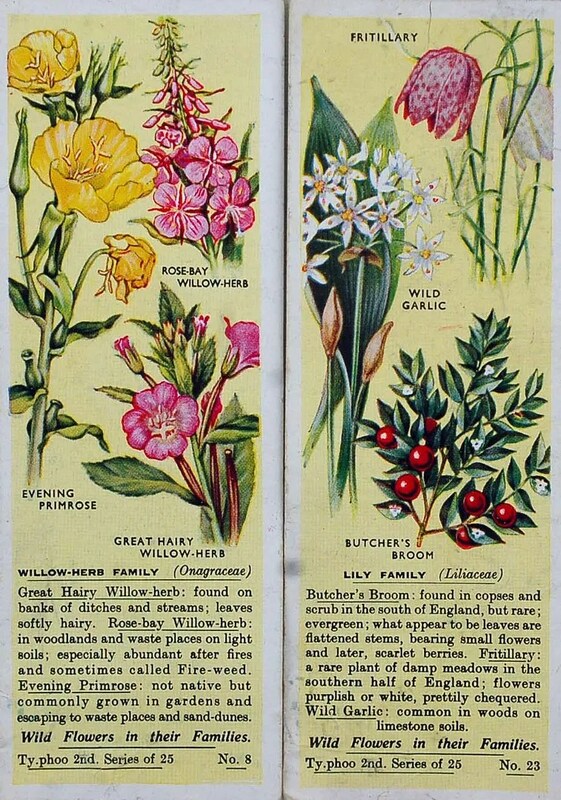 I am glad that I stumbled on to these cards, three years after working on the Typhoo Lever Filler. They are another interesting glimpse into fountain pens and their place in history. The Ty.phoo Tea Company was started in England in the early 1900s and was the first tea company to sell pre-packaged tea. Their teas were initially produced to ease indigestion and marketed this way. Though there have been many ownership changes, the brand still exists today. A partial history of the company can be found here. So what does this have to do with fountain pens? Well, for years Ty.phoo (derived from the Chinese for “doctor”) produced trading cards along with their tea. Sending proofs of purchase to Ty.phoo would result in receiving a fountain pen. This promotion lasted for several years and through different pens. The pen I recently restored is one of these pens. Before I get to the pen, here are a couple of mid-1930s examples of the collector cards. I purchased an assortment of these last year when I stumbled on the Ty.phoo pen. The pen that I acquired is of an earlier vintage than the late 1930s vacuum filler illustrated above. It is a mottled hard rubber lever filler. I reduced the pen to its parts, and found that it would need a new sac and j-bar, as well as a thorough cleaning. The lever, feed, and nib are in great shape, though the clip has lost a bit of its gold plate. I do not know who produced this pen for Ty.phoo and have read speculation that Conway Stewart, among other English producers, may have had contracts with Ty.phoo. This particular pen does have some similarities to Conway Stewart hard rubber pens of the time. After adding a new j-bar to the barrel and aligning it with the lever, I attached a sac to the cleaned section/feed/ nib. After drying, I coated the sac with pure talc and inserted the assembly into the barrel. I was very careful not to use any liquids to clean the outside of the cap and barrel, as water does not react well with hard rubber. I simply wiped it gently with a clean cloth. Here is the finished product. My favorite part of this pen, is the section, which is mottled to match the barrel and cap. Three additional pictures capture the imprint and advertising slogan for a pen to ease indigestion, the very well preserved nib, and the feed, which also matches the section, barrel, and cap. I think I will order a box of Ty.phoo tea bags, make a pot of tea, and polish up on my British History. Any guesses at to my note taking pen?